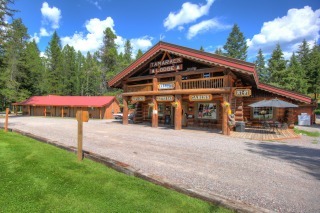 We are located about 2 mile past Hungry Horse on the right at 9549 US highway 2 East, Hungry Horse, Montana. Dependendent on season. Please check website for current hours. 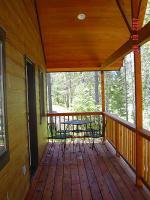 Welcome to the Historic Tamarack Lodge, a Glacier National Park Cabin Getaway. 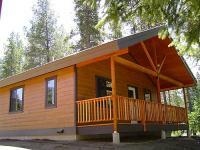 Known for our year-round outstanding hospitality, clean and comfortable cabins & lodge rooms, and affordable lodging rates, the Historic Tamarack Lodge & Cabins is situated in a spectacular scenic mountain valley in the midst of the Montana Rockies. 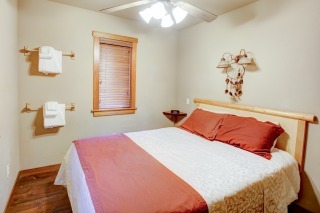 As an AAA Diamond Member, we offer private Glacier National Park Cabin Rentals and Lodge Room accommodation. Located in the heart of Bad Rock Canyon and just minutes outside of the west entrance to the Glacier National Park, the Flathead National Forest is in our backyard and we are a convenient drive to nearby Bigfork, Flathead Lake, Lakeside, Kalispell, Whitefish and West Glacier, Montana. We offer a range of different styles of accommodation to cater for every taste. With four lodge rooms and 26 private cabins we are confident you will find something to suit! Enjoy a delicious meal in our on-site restaurant. 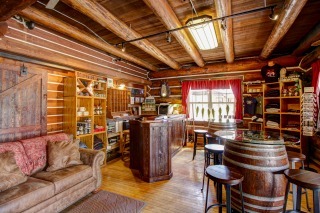 Come and visit our Saloon, Espresso Bar and Gift Shop and enjoy a hot toddy in front of the fireplace - we are open all year round for visitors travelling to and from the Park and locals alike.